Niger is an arid country of the Sahel, and it is mostly covered in desert plains and dunes. It has a savanna in the southeast, and nature is beautiful. Not many people go to Niger due to obvious reasons (usually violence), but that does not deny the fact that Niger has some gorgeous landscapes. Everyone who ever goes to Niger must see the elephants. Otherwise, there is no point in going there at all. You can also see herds of giraffes, and some of them are accustomed to being watched by people. You can get very close before they turn away. The people are so friendly with tourists that there is a chance of someone inviting you in their home. Before traveling to Niger, you must see if you need a visa to enter the country. According to Niger’s visa policy, only the citizens of 19 countries can enter Niger without a visa and stay there for up to 90 days. Visas on arrival are also available, but those who want one must have a pre-approval letter from the National Police and enter the country via Niamey. 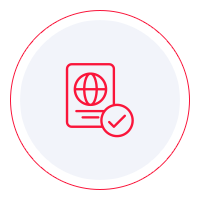 The passport is compounded for one business day, and you must return the next day at the Director General of Immigration to register and take back your passport. In all the other cases, a consular visa is required from the nearest Nigerien diplomatic mission. In order to find out in which category of travelers you are, you can read Niger’s visa policy or use iVisa’s Visa Checker. We recommend the latter solution. The tool is easy to use and displays the information you need in just a few clicks. First, you must click on the button that says Visa Checker. You can see it in the top right corner. Then, you must select your country of origin in the drag-down menu on the left and Niger in the right menu. The result will display whether or not you need a visa. And if you do, you will receive some useful information such as a list of the nearest diplomatic missions. Since the government of Niger does not issue electronic visas, iVisa cannot process visa applications. Should that happen in the future, we will be able to provide more assistance. Meanwhile, we can give you information, which is why our support service is available 24/7 and is free of charge. If the Visa Checker tells you that you need a visa, you must learn about the requirements. You can find a lot of information online, although we recommend that you should use it as a reference only. A diplomatic mission or an embassy will always be the most reliable source of information. You should contact them before going down there. In the meantime, what we can tell you is that you need a valid passport that does not expire for another 6 months from the date of arrival in Niger. We regret that we cannot help you with the Niger visa application process, and we hope that you find the information above most useful.